GlaxoSmithKline (Sirtris Pharmaceuticals) may have abandoned further research on its SRT501 resveratrol pill, but that hasn’t dampened ongoing research of this red wine molecule. Researchers at the University of Queensland (Australia) say the first in vitro (lab dish) and in vivo (living organisms) scientific evidence has certainly confirmed a role for nutra-pharmacology in health. “The data provides justification for the daily consumption of resveratrol and other plant-based chemicals containing food‐ products as part of disease prevention, which may ultimately be the reason why these bioactive compounds do exist in nature,” the researchers said. This is the first bold recommendation for widespread public use of resveratrol. While stating that resveratrol is “is still in the dawn of clinical investigation,” these researchers are essentially steering the public to navigate around modern medicine which has yet to embrace resveratrol. Take in the broad applications for resveratrol and its wide influence over the human genome (library of genes), as pictured in the following two graphics. Actually, research showing resveratrol is the most profound weapon against cancer dates back 13 years. How long will it take to translate basic research into applied science? Answer: it won’t happen until resveratrol is molecularly reconfigured into a patentable drug. (Actually, this is already underway. See prior report on combretastatin, a resveratrol-like molecule derived from bark of the African bush willow tree, made by Oxigene). The Australian researchers indicate the dietary intake of resveratrol can reach 6-to-8 milligrams per day with consumption of red wine, grapes, berries, peanuts and other foods. Dark aged red wine is the most concentrated source, providing 100-1000 times more resveratrol than plant foods. The best red wine will provide ~1 milligram of resveratrol per 5-ounce glass. Unfiltered red wine, just now being offered by some vintners, may provide even more. Nutriceuticals that provide resveratrol are offered in a very broad dosage range, from 20 to 1000 milligrams, making it difficult to ascertain the amount needed to promote health versus treat disease. Excessive dosage (more than 350 mg) appears to be counterproductive. Resveratrol – pills to replace a healthy diet? The University of Queensland Diamantina Institute, The University of Queensland*; School of Pharmacy, The University of Queensland*; Centre for Medicine Use and Safety, Faculty of Pharmacy and Pharmaceutical Sciences Monash University**, Department of Nutrition and Dietetics, The Princess Alexandra Hospital*; Mater Medical Research Institute*; School of Medicine Southside, The University of Queensland*. Nutrapharmacology, or the use of bioactive food compounds at pharmacological dose is emerging as a therapeutic approach to target the complex metabolic dysregulations in ageing and obesity-related chronic disease. 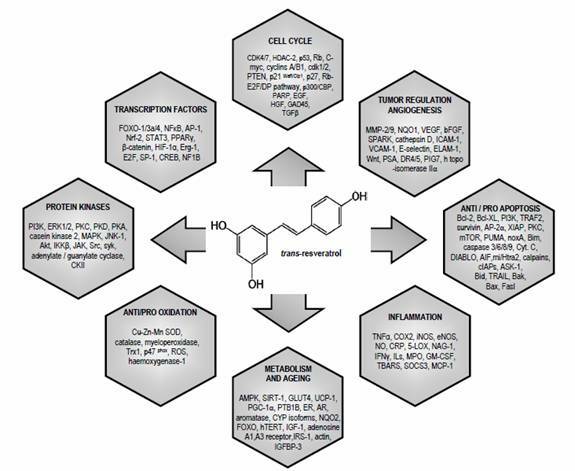 Resveratrol, a polyphenol found in the skin of grapes, and other edible plants and related food products, has received extensive attention through the link with the French paradox, and later with its chemopreventive activity demonstrated in-vitro and in animal cancer models. A plethora of laboratory investigations has provided evidence for the multi-faceted properties of resveratrol and suggests that resveratrol may target ageing and obesity related chronic disease by regulating inflammation and oxidative stress. A number of obstacles stand in the path to clinical usage however, not least the lack of clinical evidence to date, and the myriad of doses and formulations available. Further, data on the effects of resveratrol consumption in a capsule versus food form is conflicting, and there are uncertain effects of long-term dosing. 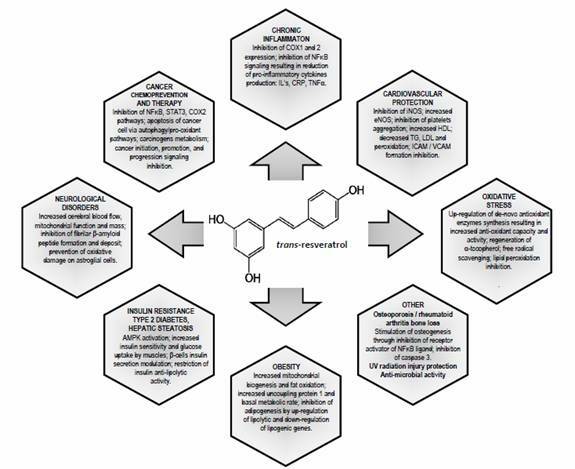 The review will summarize the human pharmacokinetic and pharmacodynamic published data, and the topics for research if resveratrol is to become a multi-target therapeutic agent addressing chronic disease. © 2011 The Authors. British Journal of Clinical Pharmacology © 2011 The British Pharmacological Society. I have been taking Longevinex for 4 months now, and I would be interested in finding out what number, if any, of my longevity genes are expressing as a result. Any idea how to go about that and what the cost might be. I suppose that Longevinex uses some Affymetrix gene chip?